SILVER BOOK, 2012, mixed media artist book, 258pp. 4.5x7 in (9x7 in open size): Consists of stream-of-consciousness abstract forms materialized by mark-making. Ink bleeds and/or indentations made by the pressure of ball pen/pencil markings from the previous pages became the starting point of the next page, creating a continuous mutation of forms throughout the consecutive pages. SILVER BOOK, 2012, video - digital collage of Silver Book, 5"x7" 258 pages, mixed media artist book, 15:55 minutes: The 258 pages of the Silver Book photo stills were digitally collaged into an animated video. The focal point of the video was the shade variations created by sunlight reflections on built-up ballpoint pen surface captured through shifting camera angles. SILVER BOOK - DIAGONAL INVERSE, 2012-2017, video, digital collage & digital overpaint on Silver Book, 5"x7" 258 pages, mixed media artist book, 06:23 minutes: Incorporated inversed digital color layer as the added aesthetic component of the digitally collaged hand-drawn original book. 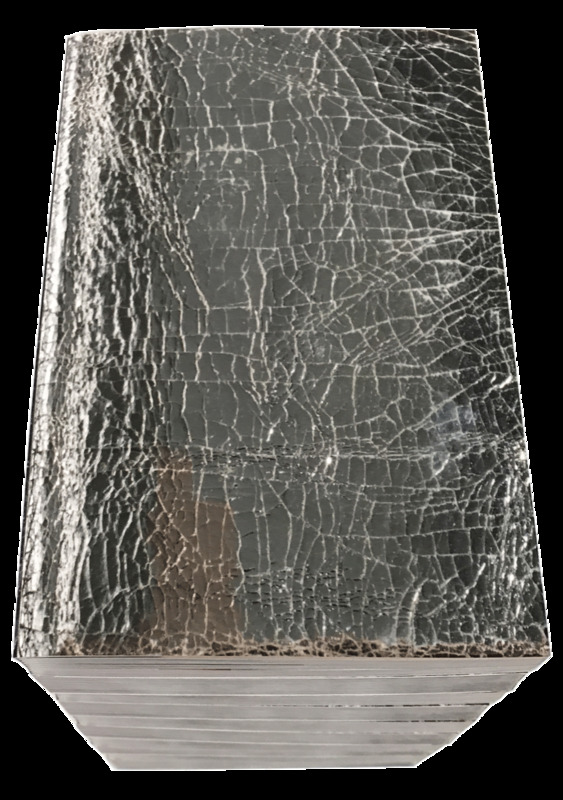 SILVER BOOK BOOK, 2018, ed. of 100, 4.5x7 in., 160pp, digital offset full color, smyth sewn binding, laminated soft cover, self-published with Small Editions, NY: The original hand-drawn book was transformed via cross-medium process and reproduced/transformed into a 100 edition printed book. The pages consist of digital overpaint on photographs of the SILVER BOOK, 2012 spread pages including a hand that holds the book. As a result, the original book is reframed in a book, and two hands – a hand in the picture and a viewer’s hand – unfold the pages. * The works-on-paper are photographed and transformed through digital over-paint, accentuating both pixel and hand-drawn quality of the composed images. SILVER BOOK BOOK – CROSS DISSOLVE 2018, video, 06:30 minutes: SILVER BOOK BOOK made into an animated video through cross dissolve video transition.